In the past four years, Max has been getting more involved in organizing the Urban Youth Arts Festival. This year marks 21 years for the festival, which takes place in two weeks, July 22nd. For me, this festival is a beautiful example of the enduring resilience and responsiveness of Precita Eyes as a community center. While teaching community mural making, Susan Cervantes saw graffiti culture develop in the neighborhood. She not only accepted the art form but invited young people into the fold, using the same values of self-expression, collaboration, and community service through spray can art. Next post I look at Susan’s stories behind the development of the Urban Youth Arts program and festival. This week I wanted to get Max’s perspective as someone who came up as a young artist with Precita Eyes now works with the Urban Youth Arts Program. 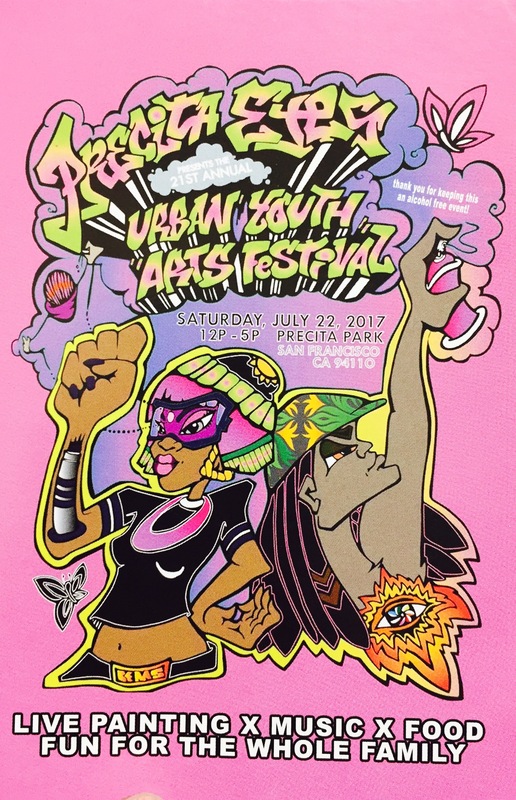 Why is it special or important to have the Urban Youth Arts (UYA) Festival? It’s good in a lot of ways. In a really simple way, it’s a family friendly thing. You can just show up. You may not know about what we do in the program, you may just be looking for something cool and fun a weird on the weekend. I think it also helps people appreciate graffiti art more. People who might think it’s all just tagging. Tagging is a touchy subject because people think it’s vandalizm, but it’s also the essence of graffiti — It’s like the sketeton. Everything else is like the muscle and the skin — and just to see it on that small level and on that big level all at the same time. I think that’s cool for people to see. And also for the community of those actual artists, I think it’s a really cool day. For a lot of reasons. One, they can come and paint. People can practice and express themselves without getting hasseled by the police. So it’s less tabboo. And also for the urban youth, or for the urban art community, just to have events like that where everyone can come and get along and meet each other and be cool. I think it is really cool for the performers of the festival too. Especially this year, we have a lot of youth performers. We have a couple older guys too, you know, just to hype it up. A lot of guys that I’m really into. But it’s mostly youngsters who helped us organize. . . . I guess they said it had been a long time, or maybe never that a woman had done a flyer for the festival. So we had Bems come through and do it. She’s a young woman. And a lot of the performers are young women too. So that was a big focus this year. We’re going to have pink shirts and everything. So that will be fun. Susan saw graffiti rise up. She was doing this mural thing, but then she started seeing this other form, then she incorporated it and sort of invited people in to do it. She provided a safe space for it to happen. I feel like that’s what the UYA program is. You do murals also, but talk to me a little bit about your perception of what those connections are. Graffiti art in general is a craft just like muraling with paint brushes. The two worlds can be very different, but they can also cross over a lot. You can’t really speak for all graffiti artists at any time really because there are so many different levels and mentalities amongst people who do graffiti. Some only do legal graffiti art and other people do both legal and illegal work, and some people who do strictly illegal work. And some people are really politicized and some people are totally not and just like to live in the moment and all that. It really takes all types. But for me personally, I see the craft in both. I like really good murals and I also like graffiti and I like people’s tags when I see them in the street. I like seeing that kind of craftmanship. So for me, it all falls under art. For me it’s really easy to appreciate both. For some people it’s not very easy for them to appreciate graffiti in certain contexts, and that’s ok. I’m not going to tell them how to feel. In the UYA cass do you get into discussions about that? A little bit. You can’t really tell people what to do. 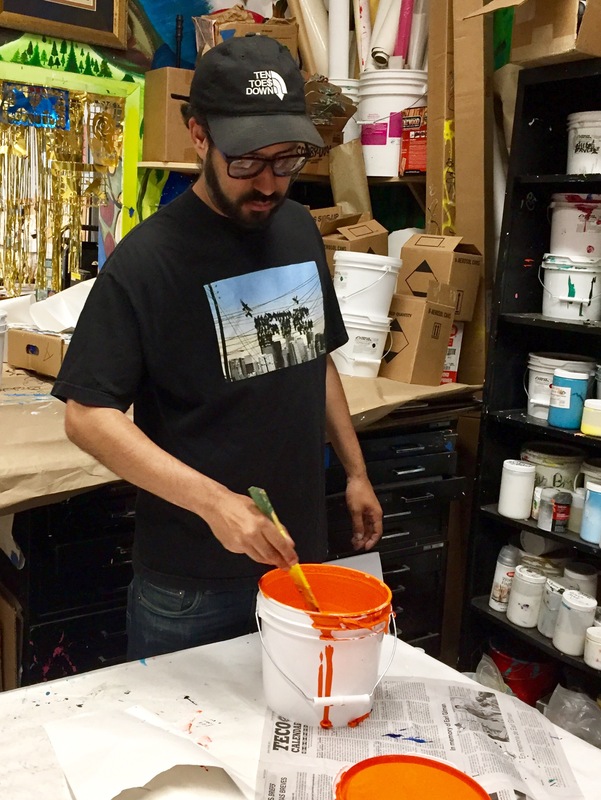 I talk about the risks involved and encourage people to get involved in the murals. But I’m totally down in drawing letters with people and I think the more your learn with a brush and the more you learn with a spray can, those mediums really inform each other. At the end of the day you can make any mural look pretty much the same with a brush or a can if you study the material and the tools that well. You can make it look dead-on the same. In the Urban Youth Arts class we teach kids stuff that they wouldn’t necessarily learn in their regular art classes in high school. They don’t usually teach how to use spray paint in a high school setting. Some places do, which is really cool. It’s a really contemporary tool, and I think it’s good for kids to learn how to use it so that they can take it and do something positive with it. At the end of the day, it’s really just a tool. So we talk about tags and stuff but we discourage people from breaking the law, we want everyone to be safe. Yeah, I’m not here to police on people. I here to teach people how to use paint and how to organize together and work together to make murals happen. That’s a big part of it too. To teach people how to work together. Like, on the scaffold, “I need you to pass me this.” We are all going to wash the brushes together. It’s a community thing, but it’s also a team thing. People have leadership roles. I think it’s really positive. I’ve been doing it long enough to see a lot of my old students are grown now. A lot of them are not painters but have turned into musicians and stuff like that. But I feel like that sense of community is still really important to all of them and they incorporate that into what they do. Some of them are artists too, still going at it thought that path.